NOTE: This article pertains to living trusts, a type of express trust as set forth in the Oregon Uniform Trust Code (ORS 130.005). Deeds titled "trustee's deed," which transfer real property by an express trust, should not be confused with deeds titled "trustee's deed upon sale," which are used to convey real property after foreclosure under a deed of trust (see ORS 86.775 for trustee's deeds upon sale). Oregon is among the majority of states that has adopted or introduced for adoption some form of the Uniform Trust Code, "a set of basic default rules that fairly, consistently and clearly govern voluntary trusts," providing a more consistent and uniform (as the name would suggest) framework of rules to govern voluntary trusts across states. States generally adopt parts of the Uniform Trust Code to work alongside existing legislation. In Oregon, the Uniform Trust Code is codified at Chapter 130 of the Revised Statutes. A trust is an arrangement whereby a settlor transfers property to another person, a trustee, who manages the assets for the benefit of another (the beneficiary). The Uniform Trust Code requires that the settlor has the capacity and expresses the intention to create a trust; that the trust has a clear beneficiary; that the trustee has duties to perform; and that the same individual is not both sole trustee and sole beneficiary (ORS 130.155). Trusts must be made for purposes that are both lawful and attainable, and for the benefit of the trust's beneficiary (ORS 130.165). 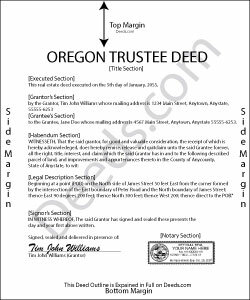 In Oregon, a settlor may create a living trust through a transfer of property to another person or to himself as trustee. The settlor conveys real property into trust by executing a deed that titles property in the name of the trustee as trustee of the trust. As with any transfer, it is important to understand the legal rights and responsibilities of vesting title in the name of a trust. For example, spouses holding property as tenants by the entirety who transfer the property into trust change their rights in the property. Consult an attorney with questions about titling trust assets. The settlor determines how his assets will be managed and establishes plans for the distribution of the trust's contents after death by executing a trust instrument. This unrecorded document also designates the trustee and the trust beneficiaries. In a living trust, "Appointing a successor trustee is essential" when the settlor also serves as the original trustee; this ensures that the trust will continue to be managed pursuant to the settlor's intentions upon his death or incapacitation. The Uniform Trust Code gives the trustee all the general powers over trust property "that an unmarried financially capable owner has over individually owned property" unless otherwise limited by the terms set forth in the trust instrument, and the specific power to sell trust property (ORS 130.720, 130.725(2)). In order to transfer real property held in a living trust, the trustee executes a trustee's deed. The trustee's deed is one in a class of instruments named descriptively after the granting party, rather than the warranty of title conveyed (think administrator's deed, executor's deed, sheriff's deed). A trustee may use any statutory deed to convey interest; a lawyer can help determine the appropriate document for the situation. In Oregon, there are four statutory short forms for deeds: warranty deed, special warranty deed, bargain and sale deed, and quitclaim deed. A warranty deed (ORS 93.850) conveys the grantor's interest and any and all after-acquired title, along with the covenants that the grantor is seized of the property and has good right to convey; that the property is free from any encumbrances apart from those indicated on the deed; and that he warrants and defends the title against the claims of all persons. A bargain and sale deed (ORS 93.860) conveys interest and any and all after-acquired title, but contains no covenants. A quitclaim deed (93.865) conveys only the interest a grantor may have at the time of the deed (and not any interest the grantor obtains after). In Oregon, trustees most frequently use a special warranty deed to convey property. A special warranty deed (ORS 93.855) has the same effect as a warranty deed, except that the covenant of freedom from encumbrances is limited to "those created or suffered by the grantor." With a special warranty, the grantor warrants and defends the title more narrowly -- solely against persons claiming "by, through or under the grantor." In addition to titling property in the name of the grantee, the granting clause of a trustee's deed names all executing trustees (as grantors), along with the trust and the trust date. All instruments pertaining to real property in Oregon also need a statement of the true consideration paid for the transfer, an adequate legal description of the property being conveyed, and the requisite mailing addresses to meet first-page requirements. All trustees involved in the transaction must sign the deed in the presence of a notary public before recording in the appropriate county. Grantees may request that the trustee provide a certification of trust (ORS 130.860) to confirm the trust's existence and the trustee's authority to enter the transaction. Each case is unique, so consult a lawyer with specific questions or for complex situations relating to express trusts in Oregon and for guidance in preparing a trustee's deed.